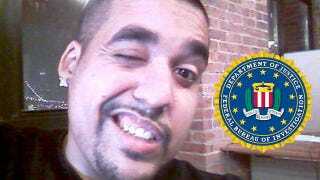 Sabu, the most notorious hacker alive and de facto leader of LulzSec, has been captured by the FBI, and apparently turned against his hacker comrades. This is how the FBI caught him and made him sing. According to a FOX exclusive, the 28-year-old Hector Xavier Monsegur was living in the Jacob Riis housing complex in New York's Lower East Side. The were able to find his address because he slipped up and logged into an IRC chatroom without masking his IP. It only happened once, but that was enough. They began surveillance, and kept the "brilliant but lazy" Anonymous leader under watch for weeks. But then a rival hacker doxed Sabu, putting his name and identity up online, and the feds had to move before he started trashing all of his hard drives and data—thereby destroying any evidence the feds hoped to collect. Agents had already subpoenaed Sabu's Facebook account, finding stolen credit card numbers he was selling to other hackers. They had enough to charge him with aggravated identity theft, which carries a two-year minimum sentence. But as the brains behind LulzSec, the man staring across the doorway at them on that summer night last year was much more valuable as a cooperating witness. "It's not me, you got the wrong guy," Monsegur said, according to sources who witnessed the interaction. "I don't have a computer." Behind Monsegur, the agents saw the Ethernet cable snaking to his DSL modem, green lights blinking on and off. Apparently, he cracked under a pretty rudimentary good cop/bad cop schtick from the agents. That seems odd, but apparently the driving force behind it was the mountain of evidence against him, and the threat of going away and having to leave his kids. Which goes to show that for all the camaraderie in the online community, it's really hard to weigh that against flesh and blood family.